No work can totally do justice to the hardship and pain caused by this war or deal with the multitude of other subjects involving the local war effort. By electronically reproducing the Roster of Twenty - One Companies Furnished by Mecklenburg County, North Carolina, In The Late War, 1861-1865, by Dr. John Brevard Alexander, we hope this pamphlet can be a starting point for more research. A previous owner, possibly Dr. Alexander, has made notations, acknowledging errors and omissions. We do not want additional information or corrections that would change the author’s original work. Many others have published research about Confederate soldiers. 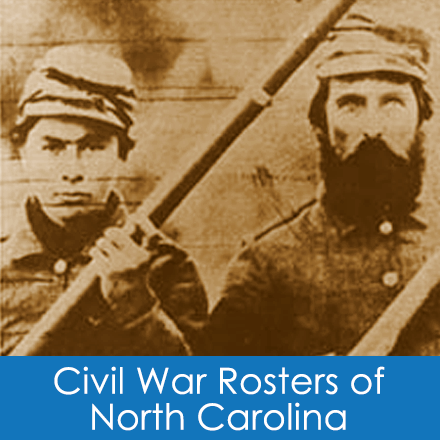 The greatest work at this time is a series entitled North Carolina Troops 1861-1865 A Roster compiled by Weymouth T. Jordan, Jr. Although all regiments have not been completed, it already provides a wealth of information on many individual soldiers. All published volumes are in the Robinson-Spangler Carolina Room. Charles H. Crutchfield interviewed five Confederate veterans from Mecklenburg Camp 382, who performed the Rebel yell live on WBT radio, Charlotte, NC.